It’s been a busy week, capped off by two days helping staff and volunteers with a bison roundup at The Nature Conservancy’s Niobrara Valley Preserve. The bison in the Preserve’s two herds are pretty much left alone all year except for one annual roundup. Those roundups allow staff to sort off animals to be sold, innoculate calves that will be kept, and get a (fairly) accurate count of the herd. Yesterday was the main event, during which animals were herded into the corrals and run through a series of gates, alleys, and pens. Most of the animals were in and out of the corral within about 5 hours. The veterinarian will be here today to help process the rest. Despite best efforts, the roundup – while important – is a little stressful for both bison and staff, so both parties are glad to see it end. As groups of animals are released to join their peers back in the hills, their excitement is palpable. The photo below captures one of those moments. 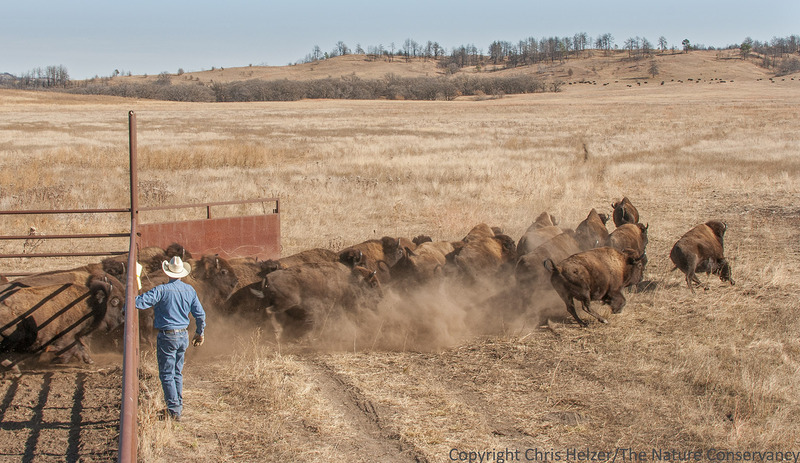 This entry was posted in Uncategorized and tagged bison, corral, grassland, niobrara valley preserve, roundup, the nature conservancy by Chris Helzer. Bookmark the permalink. Escaping fire, fleeing pursuing predators no doubt was just as stressful! I’m curious about whether roundup participants have had low-stress animal handling training? I find very few have and it shows in how they act around wild and domestic animals. Very few ranchers have taken it but they are increasing. Hardly any wildlife or natural area managers have and they could certainly benefit whether interacting with leasee’s cattle, working with private landowners or around wild deer, elk, or bison. A person with low-stress animal handling training would probably have been behind the covered gate instead of beside the open fence and everyone would have been quiet, which they may have been but not normally from what I’ve seen. I have not worked with buffalo, but there is a possibility that they would have slammed the gate as he opened it stampeded over the lop of the guy that pulled the latch. Chris, how come no photos of the gather? Rex and Steve, the process is not as quiet as you might like, but is kept as low stress as possible, given the facilities we work with. The staff is in the process of designing a new corral system that we hope will allow even less stress for the animals and people. The design will be influenced by ideas from people like Temple Grandin as well as by refinements made each time a new bison handling facility is built around the country. We’re getting better… Also, by the way, the guy in the photo is our bison manageer, Richard Egelhoff, who has worked with bison at the Niobrara Valley Preserve for 33 years, and has an amazing sense of their behavior and temperaments. He was in no danger. Oh, and I was driving a truck as we brought them all down to the corral, so I didn’t have a free hand for photography! Amazing photo. It doesn’t even seem real. Nice job. If somebody did that to me I’d be heading for the hills, too. They do seem to remember you don’t go after them right away. Ah the buffalo! A truly magnificent creature. I grew up in Casa Grande Arizona a desert farming town. A local farmer in the 60s decided would be fun if he could to buy a buffalo to graze around his farm there when a trucker offered such a deal. Well this bull buffalo did not have a female mate, but did see some ‘good looking’ cows on the John Nutt farm near Eloy Arizona. The simple barbed wire fence he had to cross was not a problem for this big brute. I remember seeing this buffalo once laying down next to his chosen ‘beauty’. I was amazed that his hump laying down was as high as the cow standing up. The farmer complained to John Nutt, that he wanted his buffalo back, now!!! John said, “well come and get him”. Needless to say that was not an easy prospect for this ‘farmer’ who did not even own a horse. This ‘pet buffalo’ was not to be and was to be sold once again. Oh, but the fairytale continues! The trucker hired was not familiar with problems of handling buffalos. “how are we going to get this guy into the truck trailer?” After some trial and error they herded up the cow and the horny buffalo followed the cow into the corral and then into the truck trailer. Ahah, mission accomplished? Well not quite. When they let the cow out the big guy had a fit and proceeded to significantly damage the trailer frame and the trucker said, “get him out of my trailer”! To the end of the story, creating a smaller space inside the trailer and luring the horny big guy up with the cow again was successful. The story has stuck with me over all those years and your story’s trevails of handling buffalos confirms you better know what you are doing. Ever since hearing your speak at the Science Cafe I have been following your blog and mailing it to my mom and sisters. Thank you. Thank YOU! It’s great to hear that you’re enjoying the blog.